BEIJING — Children in traditionally Buddhist Tibet have been banned from taking part in religious activities over the summer holidays, an official Chinese Communist Party newspaper has reported. The Global Times quoted an education official in the regional capital of Lhasa as saying that students were required to sign an agreement to "not take part in any form of religious activity" during the break. The policy appears to reflect increasingly harsh restrictions on the Himalayan region's traditional Buddhist culture, largely aimed at reducing the influence of the region's spiritual leader, the Dalai Lama, who lives in exile in India. 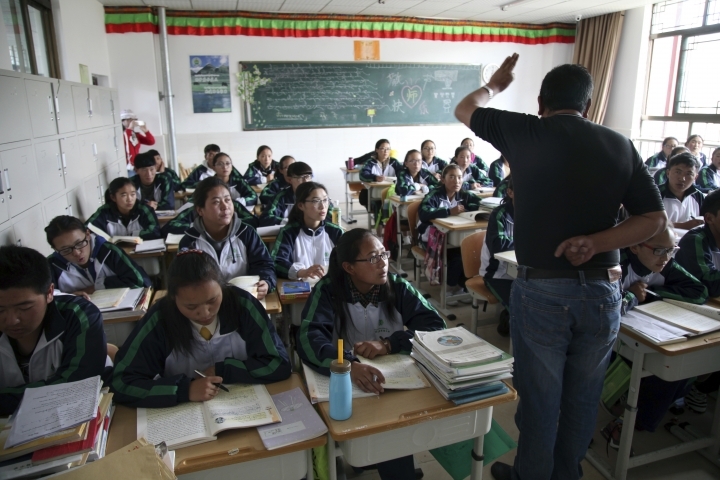 "The students are following the regulation under the guidance of their parents and teachers," the paper said, quoting Choephel, the head of the political education department at Lhasa Middle School, who like many Tibetans uses just one name. No phone number was available for the department and Chinese authorities severely limit foreign journalists' access to Tibet. The report was viewed on the paper's website on Tuesday. Many Tibetans insist they were essentially independent before the Communist Party's People's Liberation Army's battled its way into the Himalayan region in 1950. The presence of security forces was increased significantly after deadly anti-government rioting broke out in Lhasa in 2008 and spread quickly through Tibetan-inhabited areas in western China. Buddhist religious institutions that form the backbone of the region's culture have become a particular target of the authorities. The overseas-based International Campaign for Tibet reported earlier this month that young Tibetan monks were forced to leave one of the biggest monasteries in a Tibetan region of western China as part of a drive to replace monastic life with secular education. That threatens to cut the transmission of religious knowledge and monastic tradition between monks of different generations, the organization said. Recent months have also seen sweeping crackdowns on traditional Muslim culture among the Uighur ethnic minority group in the northwestern region of Xinjiang and among Christians in eastern China.